With the final meaningful use rule for EHRs on the near horizon, the race is on to qualify for federal funds. In many cases, large teaching hospitals and multipractice providers have a solid head start. Small practices, especially in less populated areas, likely have some catching up to do. To help these providers become meaningful EHR users, the Office of the National Coordinator for Health Information Technology (ONC) is setting up regional extension centers (RECs) to assist small practices, critical care centers, public access hospitals, community and rural clinics, and facilities that serve the uninsured and underserved. The RECs were made possible by a $598 million provision in the American Recovery and Reinvestment Act and are modeled on their agricultural counterparts that helped improve America’s farm productivity at the beginning of the 20th century. To date, 32 RECs have been announced, with 32 more expected to be named soon. Their initial minimum targets are to serve at least 1,000 providers and at least 20% of the primary care providers in their region, although they could potentially serve many more. Mat Kendall, MPH, acting director of the Office of Provider Adoption Support within the ONC, says his office is encouraging RECs to begin recruiting providers immediately because achieving meaningful use will be a drastic and time-consuming change, and outreach is essential to bring targeted providers on board. To illustrate this reluctance, Kendall cites an REC applicant in New York City that needed 22 contacts to convince a provider to sign up. There is no specific configuration for an REC, but there are specific milestones that they need to reach: enroll clinicians, get them live on EHRs, and help them achieve meaningful use. How they do that will depend on the needs of the population they serve, but each REC must develop an operations plan within the next couple months to explain its specific timetable. And although each REC will be different, they will have to provide certain types of expertise. After a vendor is chosen, the provider will need to consider workflow redesign. The vendor and the REC will assist with this and assessing staff training needs and infrastructure. How the EHR works with the billing system will also be addressed. 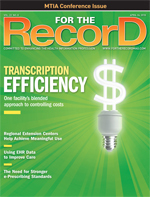 Once the EHR is live, the task of achieving meaningful use begins. “The issue about EHR go-live is that that’s just the end of the beginning,” says Kendall. “You really need to be working very aggressively once the system’s in place to maximize the efficiencies and value of the system and make sure you’re not just electrifying old paper-based systems.” Throughout this phase of the process, the RECs will continue to provide support and expertise. To assist REC efforts, Health and Human Services (HHS) recently announced it will open a national Health Information Technology Resource Center (HITRC). HHS will award $50 million for task orders that are currently being processed. One of the initial functions of the HITRC will be to assist RECs with marketing and outreach; a virtual learning community is also in the works. Many functions of the virtual learning community have yet to be finalized, but Kendall and Seidman envision it as a hub for ideas. “In general, what we want to have is a space where people could collaborate on shared documents, have a discussion, sort of like a bulletin board or wiki that they can work on, a place where we can convene to have electronic meetings, such as your WebX-type place, but also to facilitate dialogue between the programs,” says Kendall. Kendall says RECs could also help with some of the quality measures that managed care plans want their small practices to implement. Even though many details still need to be worked out, the RECs are plowing ahead. “We are going to be pushing our RECs to really assist people on a scale that has never been done before,” says Kendall, who expects a lot of regional issues will need to be overcome.